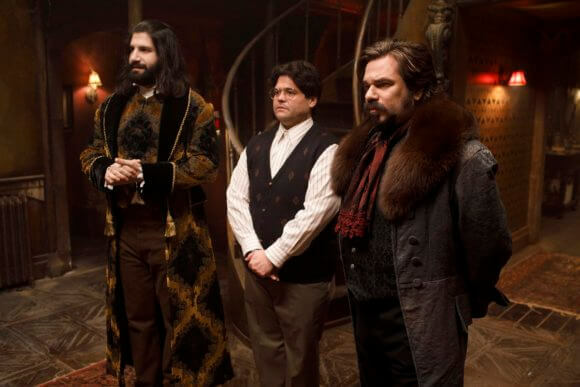 2014’s funniest film, What We Do in the Shadows, spawned what hopefully will be an equally entertaining series. FX has just released the first official trailer for the series, and it appears the vampire comedy’s captured the tone and humor of the feature film. Which makes sense as both the film and the series come from Jemaine Clement (Flight of the Conchords) and Taika Waititi (Thor: Ragnarok, Hunt for the Wilderpeople). Season one consists of 10 episodes executive produced by Clement, Waititi, Paul Simms, Scott Rudin, Garrett Basch, and Eli Bush. The cast includes Matt Berry, Kayvan Novak, Natasia Demetriou, Harvey Guillén, Beanie Feldstein, and Mark Proksch. What We Do in the Shadows will premiere on March 27, 2019. The first season will air on Wednesdays at 10pm ET/PT. “Based on the feature film of the same name from Jemaine Clement and Taika Waititi, What We Do in the Shadows is a documentary-style look into the daily (or rather, nightly) lives of four vampires who’ve ‘lived’ together for hundreds of years. In Staten Island. The self-appointed leader of the group is ‘Nandor The Relentless’ (Novak), a great warrior and conqueror from the Ottoman Empire, who has taken the helm of the group despite many of his Old World tactics resulting in what some might politely refer to as bupkis. Then there’s the British vampire ‘“Laszlo’ (Berry) – a bit of a rogue and a dandy and a fop, he might say. He’s a lover of mischief and a great soirée, but not as much as he loves seeing Nandor fail miserably in every attempt. And then there’s ‘Nadja’ (Demetriou): the seductress, the temptress, the vampiric Bonnie to Laszlo’s Clyde. Her wisdom and provocative tales from times past allow us insight into the many ups and downs of living an immortal life. Also cohabiting in the vampire household is ‘Guillermo’ (Guillén), Nandor’s familiar (a.k.a. servant/protector during the daylight hours), who wants nothing more than to be made a real vampire just like his master. Also lurking about is ‘Colin Robinson’ (Proksch), an energy vampire and day-walker of sorts — he feasts on humans, but not on their blood. A frequent visitor is Nadja’s new friend, ‘Jenna’ (Feldstein), a student at a nearby community college. She loves LARPing, boys, and art history, and for some reason has been rather confused lately as to why it is she so ravenously craves the flesh of the living.